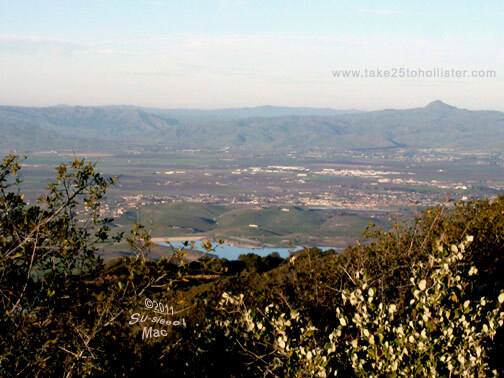 Many opportunities are available in San Benito County in various areas. 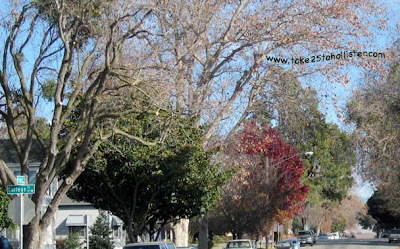 For instance, if you're into history, check out the San Benito County Historical Society or the SJB Plaza History Association. The arts? 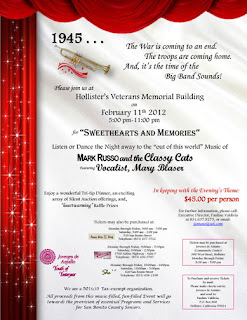 Mr. O's Academy of the Arts and the San Benito Stage Company are just two nonprofit groups that can use volunteers. And, if you would like to be a natures volunteer, think about being part of Pinnacles Partnership. 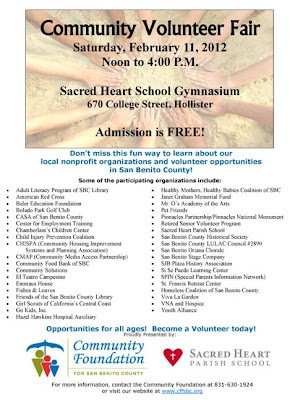 You can learn more about volunteer opportunities on Saturday, February 11, 2012 at the Community Volunteer Fair, which is sponsored by the Community Foundation for San Benito and the Sacred Heart Parish School. About 40 local nonprofit groups will be there. 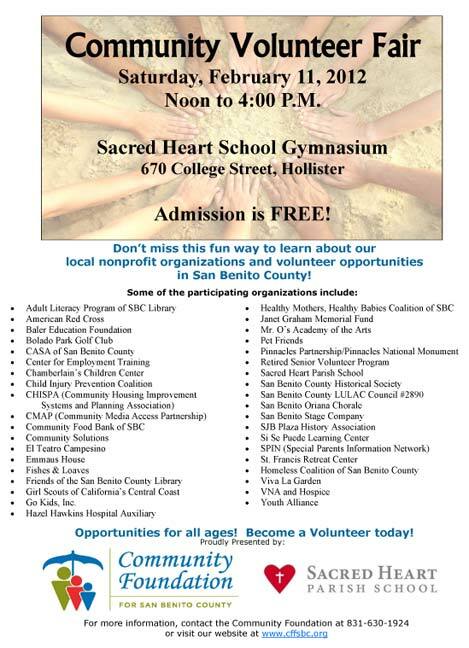 The event will take place from 12 to 4 p.m. in the Sacred Heart School Gymnasium at 670 College Street in Hollister. 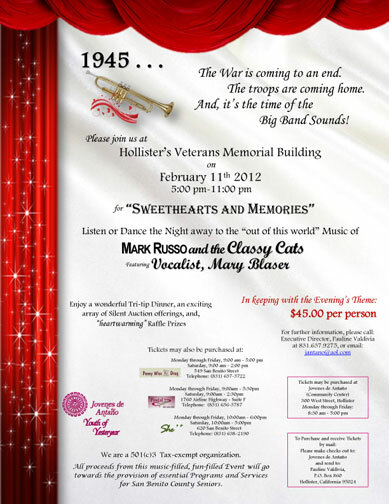 For more info, visit the Community Foundation Web site or call its office at 831-630-1924. 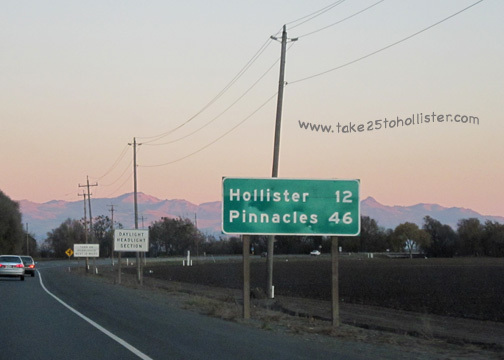 With today's post, I have accomplished my personal goal: To post a daily photo of my hometown—Hollister—or county (San Benito) for one year and a day. Hurrah for me! 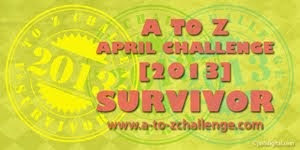 By the way, here's what I posted on the first day of my quest. So, what's next? At least a few days away from the blog. See ya. Yep. 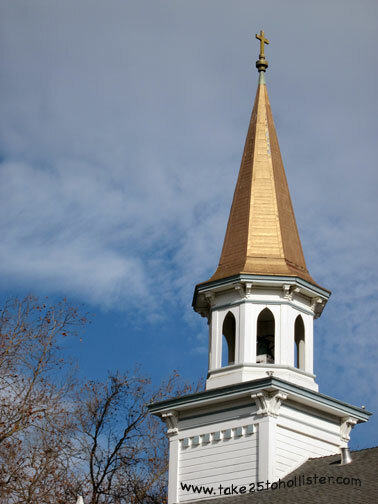 But, this time it's a close-up of the beautiful spire of Sacred Heart Church. Click here, here, and here for views of the church spire from afar. Sacred Heart Church is one sturdy building. It was constructed in 1877, but not at its known location on the corner of Fifth and College Streets. That's right. 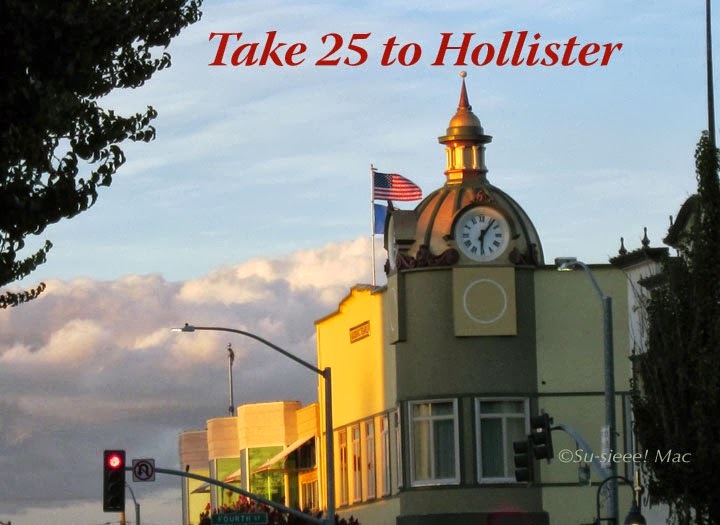 According to Welcome to Historic Downtown Hollister, a brochure by Sharlene Van Rooy, the church was originally built on the corner of West and Sixth Streets. That's where the Dunne Park Clubhouse is today. The Gothic church was moved to Fifth Street in 1939. 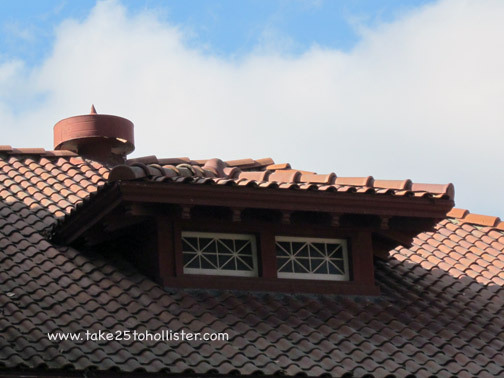 Hot-looking Mediterranean revival eyes, don't you think? 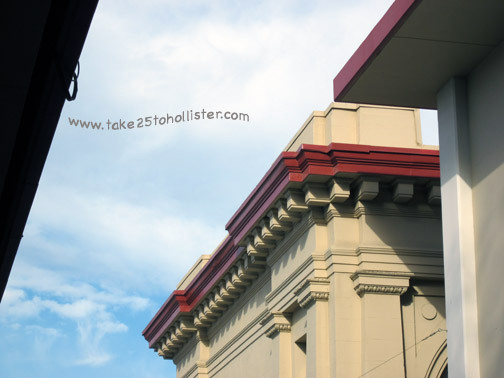 You'll find this red tile rooftop on the colorful building at 910 Monterey Street, which was once upon a time the original Hazel Hawkins Memorial Hospital. 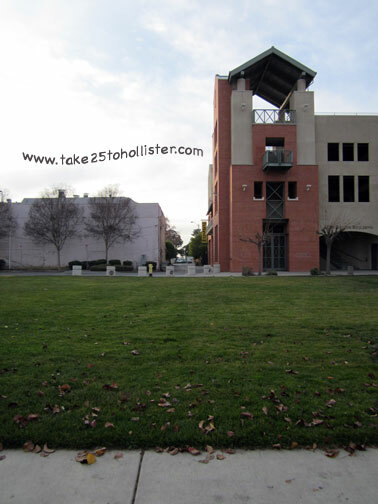 This part of the San Benito County Courthouse can be seen from the driveway between the courthouse and the building that houses the San Benito County Office of Education. It's so different from the rest of the courthouse that I wonder if this is actually the old Hall of Records. Anyone know? 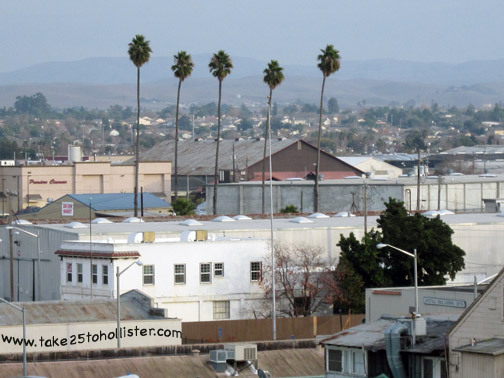 When I was a kid, many years ago, Line Street was the western boundary of downtown Hollister. Between South Street and Nash Road, orchards mostly lined Line Street. 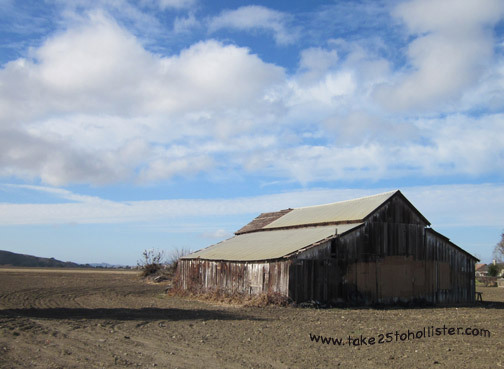 Today, this barn and the surrounding empty field, which was once full of trees, are the last remnants of that era. 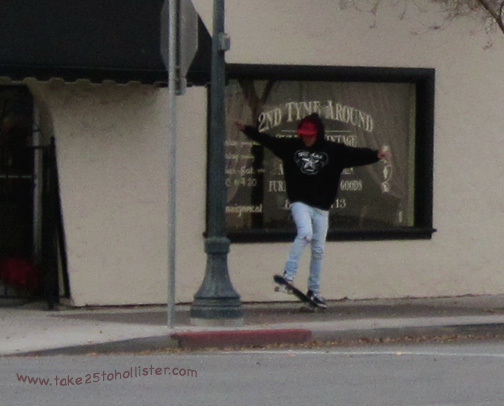 When I was a kid, I thought it would be cool to live in town. I tell the husband that and he replies, "You do." Technically, yes. We live within the city limits. But, my mind remembers when much of what is now city was county and the neighborhood where we live today was once part orchard and part chicken farm. I still think it would be cool to live. . .uhm. 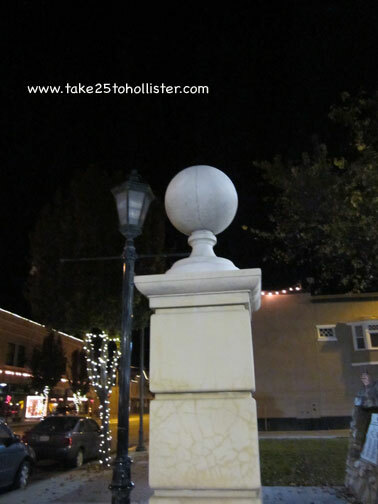 . . in historical downtown Hollister. The mountains and hillsides should be sporting some green by now. Let us hope that rain will be making its way soon. According to wunderground.com, our area has a slight chance of getting rain on Wednesday and maybe a better chance on Friday. But, that's it. I hope that changes. The sunny days have been nice. Some rainy days just would be nicer. The white building with the pinkish detail is Pat's Place at the corner of Sally and Fifth Streets. 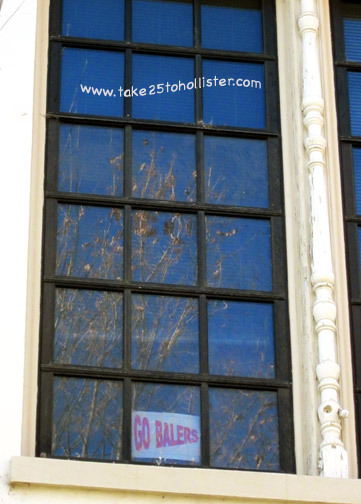 Hollister. San Juan Bautista. All of San Benito County, for that matter. I am talking photo opportunities—landscapes, fauna, flora, historical buildings, parades, events, people, and so forth and so on. I ought to know. 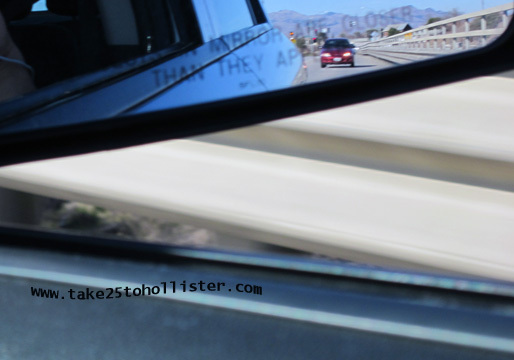 For the last 356 days (including today) I have been posting a daily photo. My personal goal is to do it for a year plus one day. So, almost there. 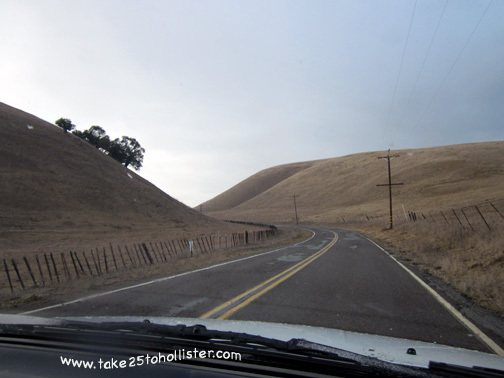 There are quite a few blogs and web sites where you'll find photos from around our sweet county. In fact, Take 25 reader Wanda G. sent me a link a couple of months ago that she thought would be of interest. It certainly is. (Wanda, I apologize for taking so long to post it.) 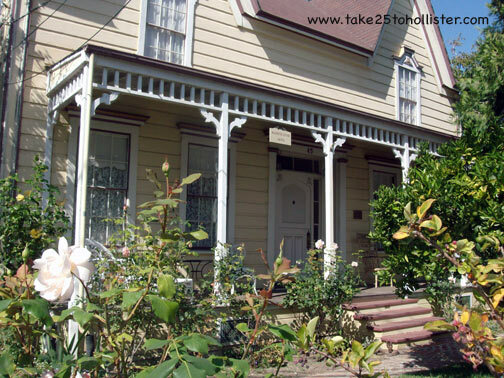 Check it out: NoeHill Travels in California: Photographs of historic sites and points of interest in San Benito County. Here are a few other links I've found that are interesting. Do you know of other cool sites? Please share the links in the comments section. Yesterday, the view was from Union Road. Today, the sweet view is looking up Quien Sabe Road from the North side. Yep. 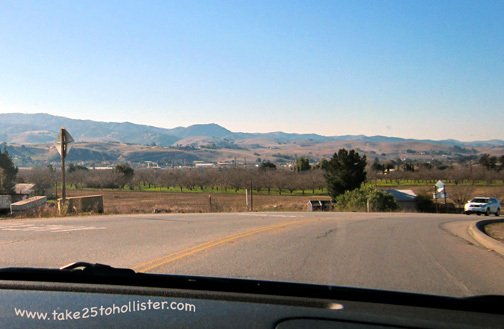 One of the sweetest views in San Benito County is from Union Road, just pass the intersection at Airline Highway (aka Highway 25). This is just a bit of that view. How Do You Enter the Parking Garage? 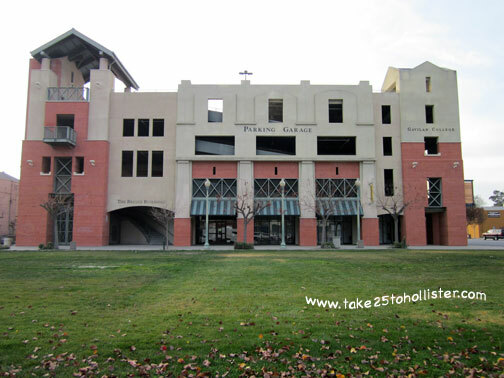 The four floor parking garage, as viewed from San Benito Street. 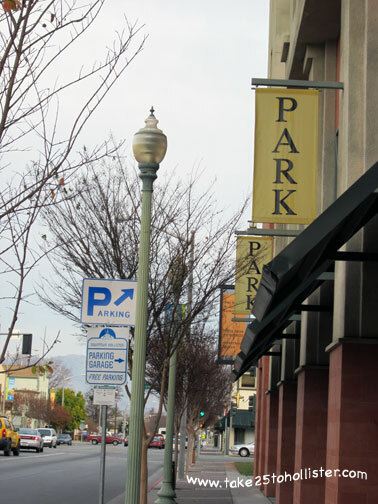 Parking at the Briggs Building parking garage on Fourth and San Benito Streets is free. 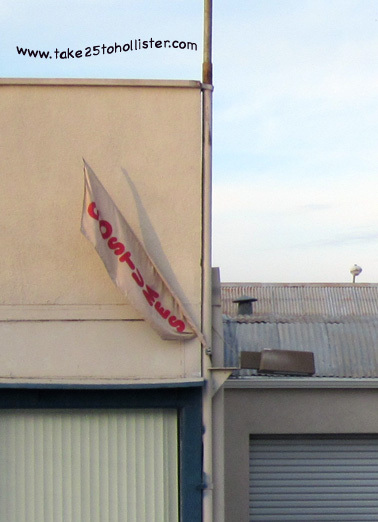 There are yellow banners on the San Benito Street side of the building that shout Free Parking. You can read them when you're standing in front of the building, but not when you're driving your car and trying to figure how to get into it. 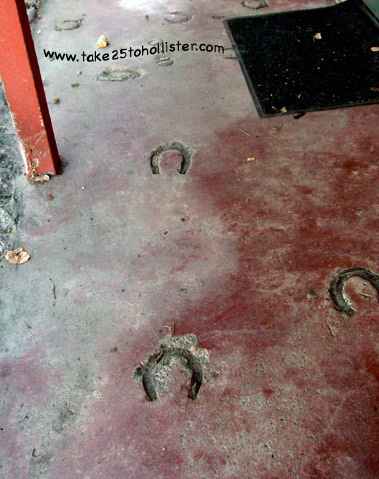 So, I ask again: How do you enter the parking garage? You enter the parking garage via Briggs Alley, which you access by driving through the small public parking lot between the Vault and the Granada Theater that is on Fifth Street. So, if anyone says to you during the Farmer's Market season (May through September) that you can conveniently park in the parking garage, know this: Be sure you get there before the farmers and vendors set up their booths and tables. Update: I forgot to mention that Briggs Alley is one-way. I have been told that on Farmer's Market Day, people are allowed to drive the reverse way on Briggs Alley so that they can enter the parking garage. Seems to me the powers-that-be ought to make that change permanently. (Granada Theater) is Briggs Alley. They—the costumes—can probably be bought at Lost Treasures on 5th Street. (Cross street is Sally Street.) But, one never knows. They may be available at Maverick Welding Supply. 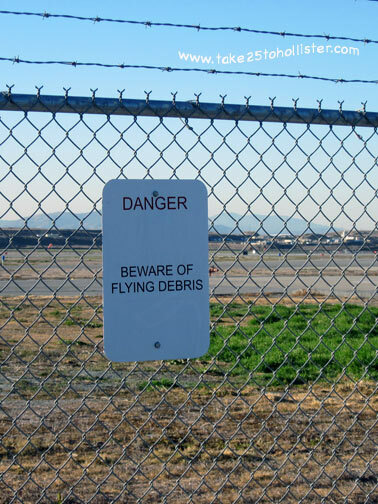 It's difficult to say which building the sign post is on. That's how it looked last week. 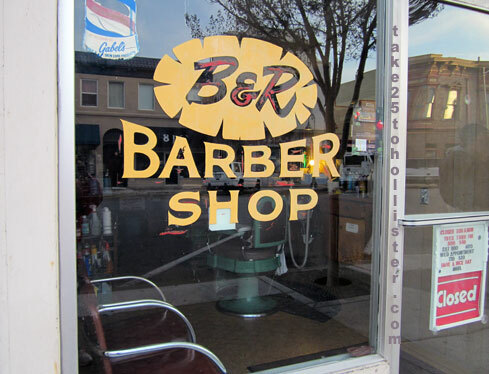 The B&R Barber Shop is a very old-time establishment in Hollister. 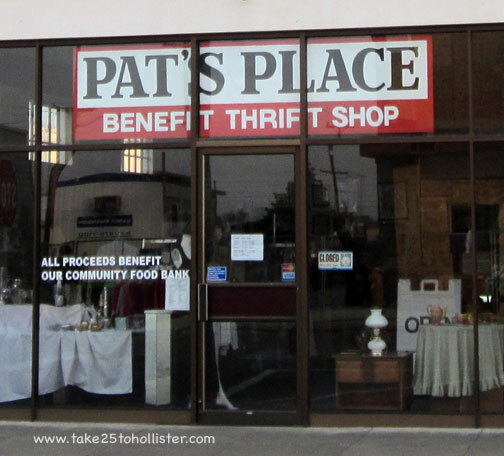 You'll find it on Fifth Street, between East and San Benito Streets. 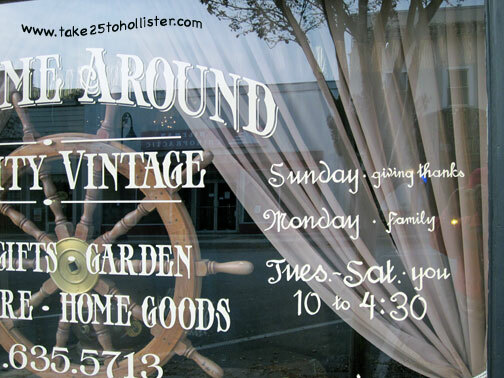 I like the store hours of Second Tyme Around, the vintage furniture store at the corner of Fifth and East Streets. The store opened last summer. 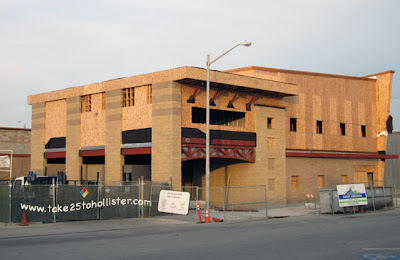 Until construction of the downtown fire station at the corner of Sally and Fifth Streets is complete, the Hollister Fire Department is temporarily located in the vacant lot on Fourth Street, behind the west end Briggs Building Garage. The old station was demolished earlier this year. 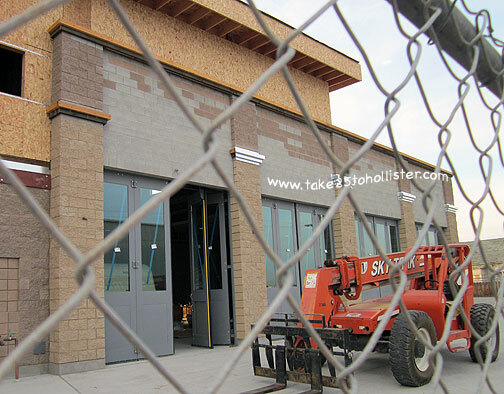 Being built is a two-story facility with twice the space of the old station, which was a converted tractor garage. According to this local news article, the station should be completed within one year's time. 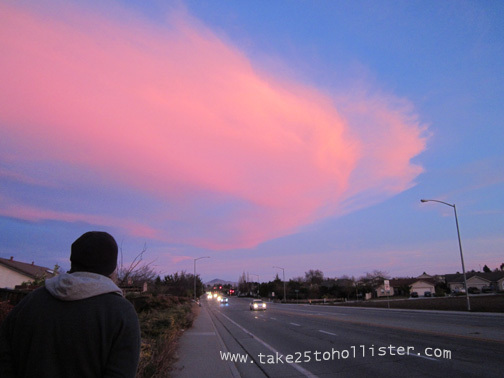 You never know what you may see while walking just before sunset.